“Never Again (Again)” art exhibit: Detroit artists respond to Trump’s first 100 days in office. 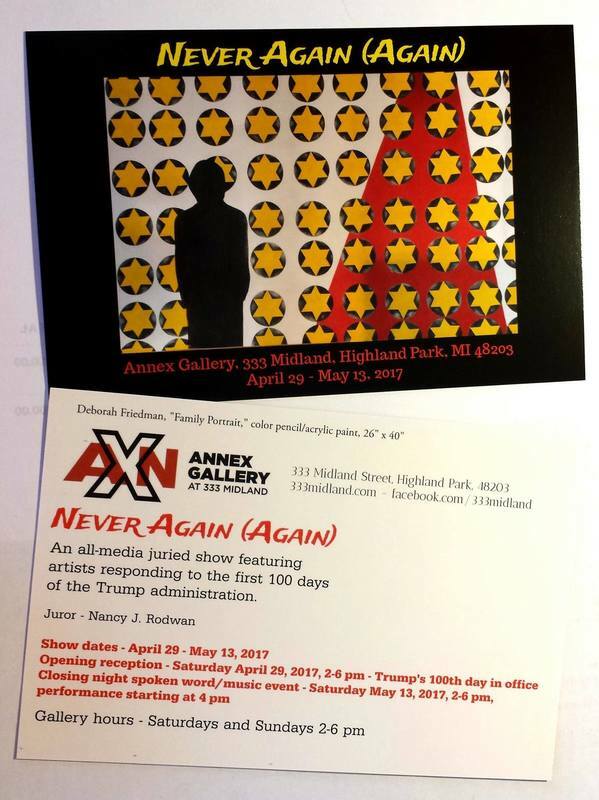 On Saturday, April 29, 2017, the 100th day of the Trump administration, the opening reception for the exhibit “Never Again (Again)” will be held at The Annex Gallery, 333 Midland, Highland Park, 48203 from 2:00 pm to 6:00 pm. The show runs through May 13. The Annex Gallery is donating 15% of all art sales to the ACLU. 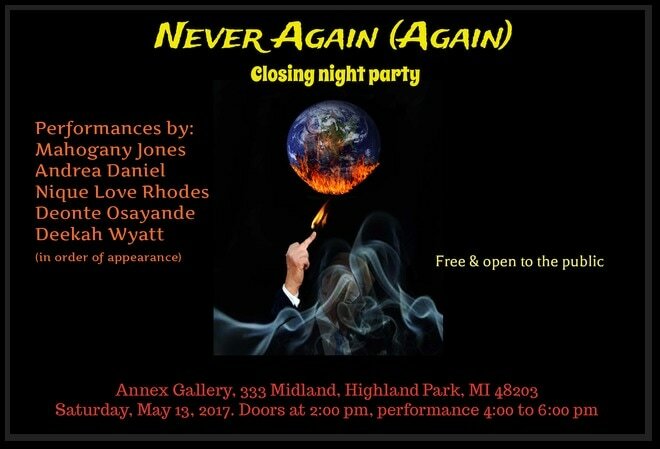 A rare and dynamic combination of Detroit talent will close out the art exhibit “Never Again (Again).” The performance will be held at the Annex Gallery, 333 Midland, Highland Park, 48203 from 4:00 pm to 6:00 pm on Saturday, May 13, 2017. The political art show that “ranges from sober to gleefully savage,” according The Detroit News, addresses Trump’s first 100 days in office ends its run with powerful performances by recent Kresge arts fellow and performance artist Mahogany Jones, hip-hop artist and activist Nique Love Rhodes, and poets Deonte Osayande and Andrea Daniel. Vocalist and guitarist Deekah Wyatt will close out the night with a rousing acoustic set. The event is free and open to the public. The gallery opens at 2:00 pm to provide viewers one last look at the exhibit before the performance that goes from 4:00 pm to 6:00 pm.